The final Ironman race of the year takes place in Busselton, Western Australia this weekend. It’s probably the flattest Ironman on the calendar, but far from an easy race. Conditions can be hot and windy, and racing well on a perfectly flat course is a challenge in itself. 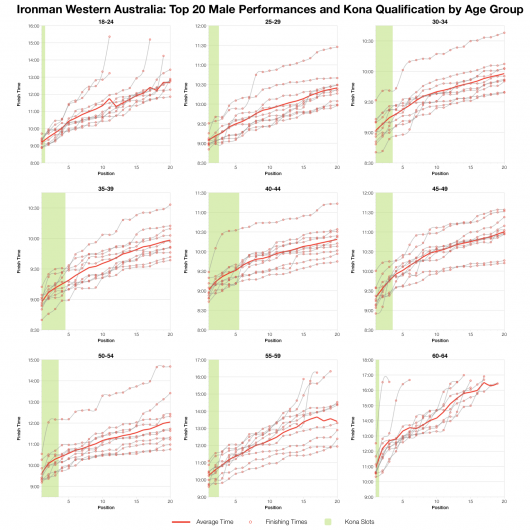 Generally times at Ironman Western Australia compare ot other races down under as does the level of competition for the 40 Kona slots on offer. 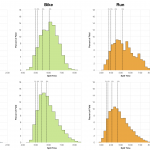 You can find more detailed, age group specific versions of the following race statistics at the end of this post. To help place performances at Ironman Western Australia in context I’m comparing with the results from all Australian/New Zealand races in 2012 (I didn’t use 2013 due to the shortened swim at Ironman Melbourne). It is worth bearing in mind the course in Busselton has changed over the last decade, although this hasn’t had a huge impact on the general trends at the race. 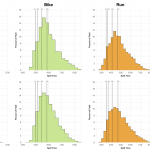 Busselton shows a very similar set of medians to the other Australian races, if there are any differences to note the run may be slower in some age groups. 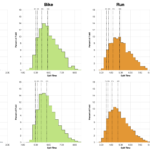 Looking at split distributions for these two groups of races and the main difference actually appears to be a slightly faster bike in Busselton than in the other races. This also extends to very slightly faster overall finishing splits, but I wouldn’t consider the differences hugely significant. 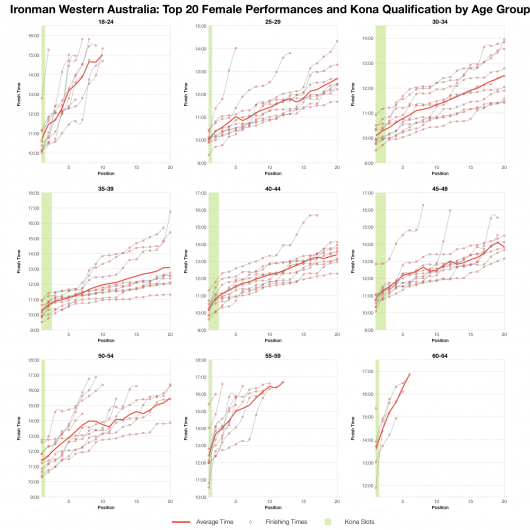 Generally Ironman Western Australia looks to be typical of Ironman racing down under. 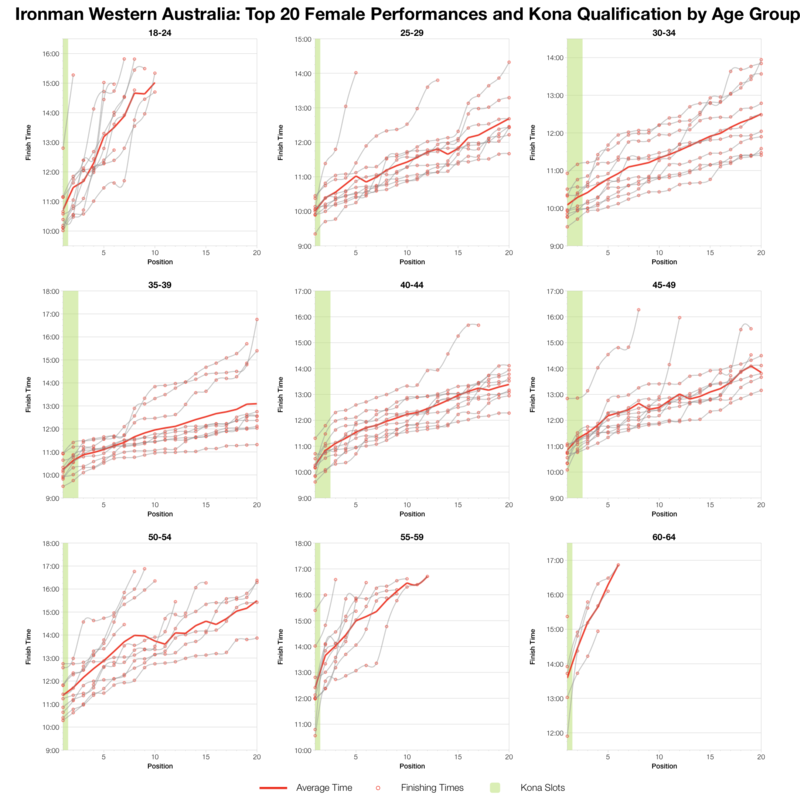 There are 40 Kona slots on offer at Ironman Western Australia, my estimates for their age group allocations are in the table above. As always the final numbers will likely vary based on start numbers. Conditions have varied enough in Busselton that finishing times for the top 20 age groupers cover a wide range over the last decade. While that variation is true, the level of competition has generally been consistent based on the time differences from first to tenth and then twentieth. 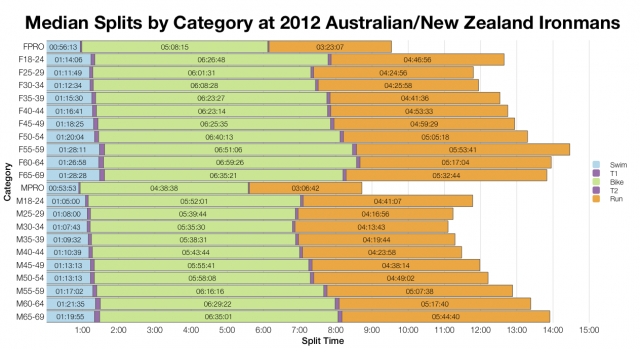 Of course there have been exceptions, but the averages clearly indicate that qualifying times are fast, often requiring a low 9 hour or even sub 9 hour time for the male age groups. It’s equally competitive for the women and with few slots available a time in the low 10 hours or below 10 will often be required. More details for each age group are available in the PDFs below. 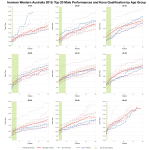 Age group specific Ironman Western Australia results analysis – more charts and more detailed timings and splits for the top age groupers. Found these statistic useful? Support the stats, buy me a coffee. 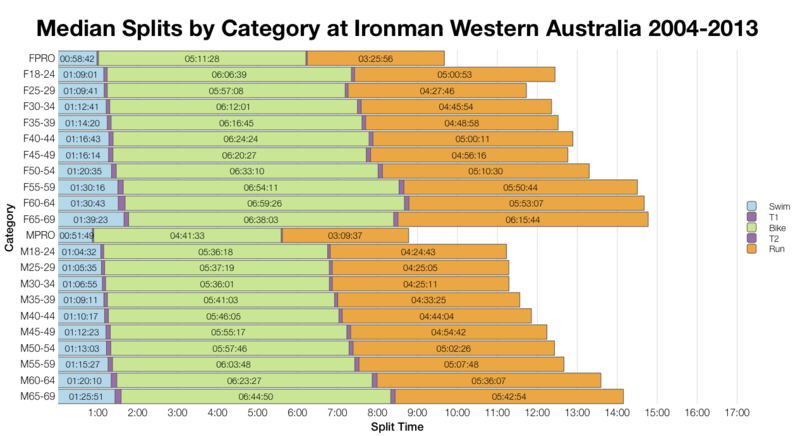 I’ll post an analysis of the 2014 Ironman Western Australia results after the weekend.